While it is true that the Biblical family is under attack, it is also true that we are in a time of unprecedented opportunity to press the crown rights of Jesus Christ, starting in our own families. Follow me, Andrea Schwartz, based on my years as a parent, educator, and mentor, as I address practical concerns and problems that you face on a daily basis. Some of my ideas will inspire you. Some might make you uncomfortable. All will challenge you to think in terms of being Kingdom-driven in your personal and family life. Sign up for my free e-letter – The Kingdom-Driven Family – and receive ideas and commentary to help you in building a home that serves Christ and His Kingdom. 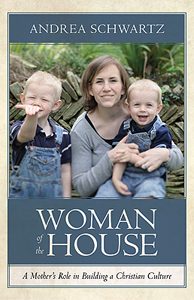 As my way of saying thanks, you will receive a free download of my book, Woman of the House: A Mother’s Role in Building a Christian Culture. Thank you for the book, Andrea! It is pleasure to read and hear your books and articles, interviews with wise people and to get more practicle knowledge on how to live our christian life daily. God bless your heart and efforts!